Having just had a few days off I have come back to the usual full mailbox and a quota that’s blown so need to clear items out before I can send anything. This is a very common place occurrence for people now, but how do we actually behave with and use email? 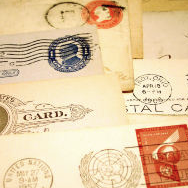 A recent study “Evolution of Conversations in the Age of Email Overload” carried out by Yahoo and Cornell University studied more than 2 million users exchanging 16 billion emails over several months. The study itself shows some interesting results, but is based between pairs of people who send more than 5 replies to each other and have opted in to surveys which provides a level of bias into the survey. 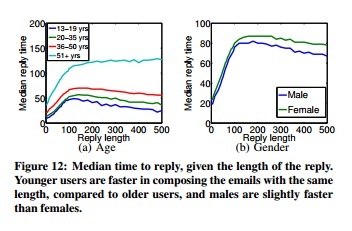 Youngest email users, teens, have the fastest reply times; as users get older they become slower to reply to emails. These figures for me show how the Younger Generations are more reliant on technology and interact with social media at a more frequent rate than their peers. It would be interesting to see the results on a wider distribution of users and email interactions though and if that has a skew on the results, also what device the users have access to which may dictate the speed of the reply. Hashtags, either love them or hate them, but they are here for the long term and they are spreading. Recently I have started to receive a number of emails (from different people) using the Hashtags for things such as #Max to indicate the bit that I need to read in the email when its gone to multiple recipients or #Action for the things I need to do. Typically I have always received emails with the words Max or Action in them, but the addition of the # is more recent. It certainly makes the words on the page noticed a bit more as its a character my eyes are not normally used to seeing. There is certainly an ever decreasing line between social media and work communication etiquette. Maybe its time to update the definition to include emails. I was chatting with a colleague in the office about the survey I am currently conducting and he suggested that I be aware of the “Echo Chamber Effect” when analysing the results. So I went off to look further into this. This effect appears everyday in Social Media and people may be doing it without realising or being swayed by it. As people are more socially linked and their feeds and adverts are tailored to their social and browsing habits. One video worth watching is by Eli Pariser who presents a TED Talk on “Beware on-line filter bubbles” which shows how browsers and social media are filtering what you see based on your habits. Is there an antidote to this? One of the great worries about the Internet is the echo chamber effect: the notion that democratized media have given us a way to pay attention only to the people we know we’ll agree with, paying no attention to contrary views or, often, reality. This is no idle worry. But the same digital media that make it possible to retreat into our own beliefs give us easier ways to emerge, and engage. Learn from people who live in places and cultures entirely different from your own. Listen to the arguments of people you know you’ll disagree with. There are lots of other sources available on the internet that cover the subject, but for me this has been an interesting skim across the surface highlighting the need to be aware of this and apply some treatments to the survey results so I try not to cause an Echo Chamber Effect. People spend a lot of time behind electronic devices these days communicating with others through various forms of apps and social media. Have you ever stopped to think how many people you have actually spoken to face to face rather than through a GUI? I thought it may be useful to call out a Networking Tool that may help you record your daily interactions and think about who you have networked over the past week. This is a tool that anyone can use. The tool is from a chap called “David Seah” who has several other productivity tools available, but this one is called the “Network Catch-O_Matic”. Primarily created as a sales and marketing tool, it can be use to capture and build up your interactions. Yes this is a Paper based tool but sometimes the simplest things are the best. The Network Catch-o-Matic is a simple counting form. Along the top is a row of 50 bubbles, each representing a person. As you encounter people during various periods of the day/week, fill in the number of people you would think of approaching. For salespeople, this would be the people on your prospect list, or perhaps people you target at a networking event or trade show. Being seen. So you see a person. If you aren’t seen by them, you’re not going to have much of an impression. Fill in the number of people out of the people you’ve seen who “see you back”: you’ve made eye contact, or otherwise indicated that they are open to conversation. A lot of them will look away, but don’t worry about that. It happens a lot! Talked with. So you’ve made eye contact. Say something, already! Exchanged info. You’ve had a brief conversation, and you have successfully piqued the interest of the other person such that you can exchange contact information. Score! Planned to talk again. Not only have you exchanged cards or phone numbers, but you’ve even made a mutual promise to talk in the future. Wow! Actually did follow up. Actions speaker louder than words…if you actually DID meet up again, you’re on your way to establishing some kind of relationship. This can happen multiple times. Am collaborating. You’ve formed a relationship, and are now actively working together. In sales terms, you’ve closed the deal. In personal terms, you’ve made a friend. There is also an area for listing the important people you have spoken with as well. The Year Date may be wrong on the form, but the principle still holds.